Rye is a difficult beer flavor to pin down. It’s a grain in the larger wheat family whose signature—usually described as “spicy”—is familiar to rye whiskey drinkers. While most beer is brewed with barley, the addition of a percentage of rye in the grain bill can add a welcome layer of aroma and flavor. If you want a master class in rye’s many faces, Rye on Rye from Kansas City, Missouri’s Boulevard Brewing offers a delicious lesson. The base style—a rye beer fermented with Scottish ale yeast—combines two-row malt (standard barley malt) with English crystal and German rye, plus a few other specialty malts sprinkled in like seasoning. To double up on the rye angle, that beer is aged in Templeton Rye whiskey barrels for six to 18 months. Brewers then blend those aged beers together in various proportions plus a pinch of the fresh base beer to create the final Rye on Rye blend. Whiskey drinkers, this should all be up your alley. In fact, I would suggest considering this beer like a whiskey in terms of its drinking occasion. It’s a brawny 12 percent ABV with strong flavors and a definite after-dinner vibe. I poured myself a snifter after a weeknight meal and settled into my armchair, attempting my best Ron Burgundy. Rye on Rye pours a handsome garnet color with a pleasing, fluffy head. Before the glass even reached my nose, I picked up wet whiskey barrel notes, with big dried fruit character of apricot and golden raisins. A swirl of the glass brings out the rye spice as well as molasses and clove, supported by rich toffee aroma. It’s tightly knit but not messy; each piece of the puzzle remains distinct. Like mulled wine, its warm spice character is inviting. The sip unfolds much of its flavor upfront, with a rye tickle kicking up the doughy supporting notes of toffee, caramel, and cinnamon-raisin bread. The aged portions of the beer contribute a bit of sherry and leather, hallmarks of beer that’s slumbered in barrels a while. They’re a nice counterpoint to some of the rich sweetness, and the whole package fades out to a pleasantly warming but not at all harsh swallow. After the sip, I could feel a happy glow in my throat and chest—just what I need on a cold January night. I love this beer as an after-dinner or dessert beer; once I thought of pairing it with bread pudding, I couldn’t stop thinking about it. (I have yet to actually conduct this pairing experiment.) There’s also a case for pairing Rye on Rye with something rich like duck or a pastrami sandwich—Rye on Rye … on rye?—but sipping it solo allows for the full contemplation of its layers, and of the interplay between rye whiskey barrels and a rye beer. I see why Boulevard brought this beer back; it was last released in 2015. It should be available through February, at which point the weather will—god willing—usher us into lighter, springier beers. For now though, curl up with a bottle of this, and stay classy. 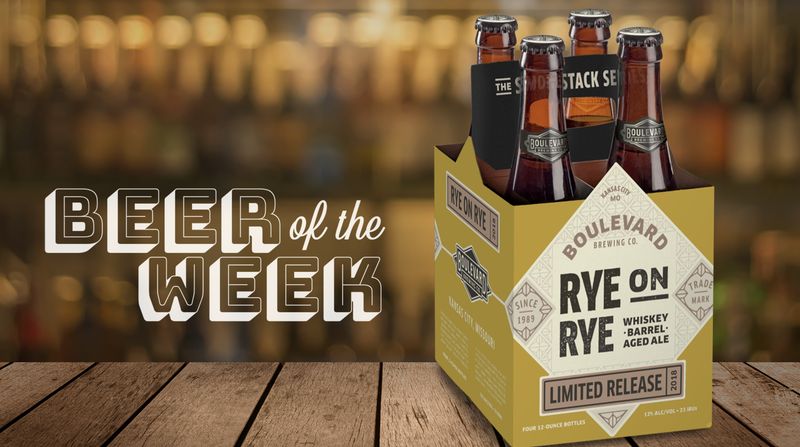 Rye on Rye is available in 750mL and 12-ounce four-packs throughout Boulevard’s 39-state distribution territory.